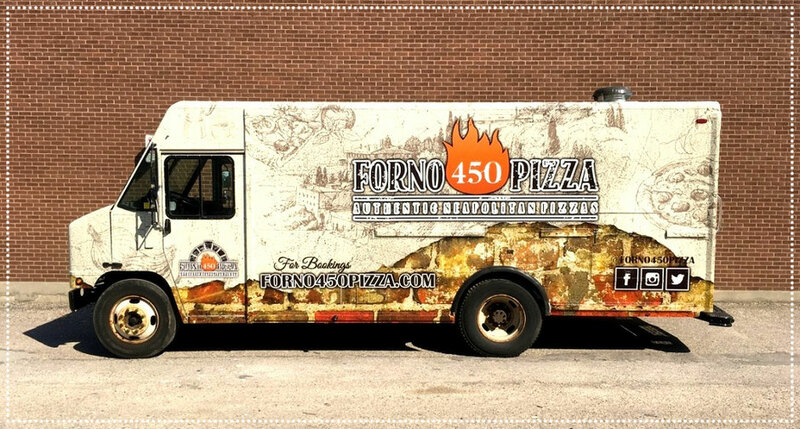 Forno 450 Pizza brings you authentic Neapolitan pizza on the go. At Forno 450 Pizza, we adhere to centuries-old traditions to bring you one of the most authentic, wood oven cooked pizzas to be served from a mobile pizzeria. We start with a custom wood burning oven, hand-built by a manufacturer in Naples with over 100 years of experience in the craft, and heat it to the perfect 450C. We then create your personal pizza using flour, olive oil, and tomatoes all imported directly from central and southern Italy. Along with the passion that comes from a classically trained chef who believes in using only the best ingredients, our mobile pizzeria delivers true Italian taste wherever it travels.